Mars may be going through a period of climate change, new findings from NASA's Mars Odyssey orbiter suggest. Odyssey has been mapping the distribution of materials on and near Mars' surface since early 2002, nearly a full annual cycle on Mars. Besides tracking seasonal changes, such as the advance and retreat of polar dry ice, the orbiter is returning evidence useful for learning about longer-term dynamics. The amount of frozen water near the surface in some relatively warm low-latitude regions on both sides of Mars' equator appears too great to be in equilibrium with the atmosphere under current climatic conditions, said Dr. William Feldman of Los Alamos National Laboratory, N.M. He is the lead scientist for an Odyssey instrument that assesses water content indirectly through measurements of neutron emissions. "One explanation could be that Mars is just coming out of an ice age," Feldman said. "In some low-latitude areas, the ice has already dissipated. In others, that process is slower and hasn't reached an equilibrium yet. Those areas are like the patches of snow you sometimes see persisting in protected spots long after the last snowfall of the winter." Frozen water makes up as much as 10 percent of the top meter (three feet) of surface material in some regions close to the equator. Dust deposits may be covering and insulating the lingering ice, Feldman said. He and other Odyssey scientists described their recent findings today at the fall meeting of the American Geophysical Union in San Francisco. "Odyssey is giving us indications of recent global climate change in Mars," said Dr. Jeffrey Plaut, project scientist for the mission at NASA's Jet Propulsion Laboratory, Pasadena, Calif.
High latitude regions of Mars have layers with differing ice content within the top half meter (20 inches) or so of the surface, researchers conclude from mapping of hydrogen abundance based on gamma-ray emissions. "A model that fits the data has three layers near the surface," said Dr. William Boynton of the University of Arizona, Tucson, team leader for the gamma-ray spectrometer instrument on Odyssey. "The very top layer would be dry, with no ice. The next layer would contain ice in the pore spaces between grains of soil. Beneath that would be a very ice-rich layer, 60 to nearly 100 percent water ice." Boynton interprets the iciest layer as a deposit of snow or frost, mixed with a little windblown dust, from a cold-climate era. The middle layer could be the result of changes brought in a warmer era: The ice down to a certain depth dissipates into the atmosphere. The dust left behind collapses into a soil layer with limited pore space for returning ice. Information from the gamma-ray spectrometer alone is not enough to tell how recently the climate changed from colder to warmer, but an estimated range might come from collaborations with climate modelers, Boynton said. Other Odyssey instruments are providing other pieces of the puzzle. Images from the orbiter's camera system have been combined into the highest resolution complete map ever made of Mars' south polar region. 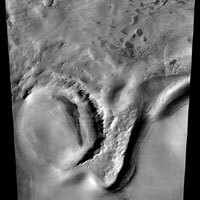 "We can now accurately count craters in the layered materials of the polar regions to get an idea how old they are," said Dr. Phil Christensen of Arizona State University, Tempe, principal investigator for the camera system. Temperature information from the camera system's infrared imaging has produced a surprise about dark patches that dot bright expanses of seasonal carbon-dioxide ice. "Those dark features look like places where the ice has gone away, but thermal infrared maps show that even the dark areas have temperatures so low they must be carbon-dioxide ice." Christensen said. "One possibility is that the ice is clear in these areas and we're seeing down through the ice to features underneath." Odyssey's high-energy neutron detector continues to monitor seasonal changes in the amount of carbon-dioxide ice deposited in polar regions, allowing tests of atmosphere-circulation models, said Dr. Igor Mitrofanov of the Institute for Space Research, Moscow, Russia. Measurements by an instrument for monitoring the radiation environment at Mars show the level of radiation hazard that Mars-bound astronauts might face, including levels during a period of unusually intense solar activity, said Dr. Cary Zeitlin of the National Space Biomedical Research Institute, Houston. JPL manages Mars Odyssey for NASA's Office of Space Science, Washington. Investigators at Arizona State University, Tempe; University of Arizona, Tucson; NASA's Johnson Space Center, Houston; the Russian Aviation and Space Agency, Moscow; and Los Alamos National Laboratory, Los Alamos, N.M., built and operate Odyssey science instruments. Information about the mission is available on the Internet at: http://marsprogram.jpl.nasa.gov/odyssey.